Welcome to this week’s News from the Windows Store. The week saw a flurry of activities in the Store, I was expecting doldrums this week given the trend of last week, but Microsoft surprised us by releasing one of the most expected app: Netflix this week. The debate is on-going whether this is by overt or by covert, a sleight of hand from Microsoft. Did they accidentally released this app or was it intentional to keep the buzz going? This coming week will tell if Microsoft decides to release another major app, that will then point to keeping the buzz going. Those of us tracking MS know they’ve got some serious Apps in Keeps for the GA. So the question remain “What Will MS Do” this coming week :-). 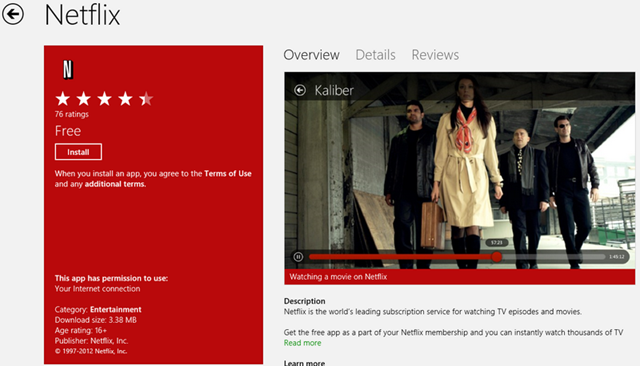 Coupled with this bang from the Store this week were the completion of the updates to the Windows 8 Built-In Apps. Every App from Microsoft is now updated bringing more features to these apps and welcomed stability updates. The most noticeable for me is the Mail App which now supports Conversations view. Another surprise from Microsoft is the release of two paid XBox Titles this week. Microsoft added 4 Elements II Special Edition at $9.99 and Rocket Riot 3D at $4.99. Click on the Pictures to get them from the Store. I mentioned a flurry of activities, this is not only limited to Microsoft this week. The Indy Developers were also hot on the heels of Microsoft in releasing updates to their Apps. I think I counted about 10 App updates this week. The most popular of course is the Update to MetroTwit Twitter client in the Store, followed almost immediately by the release of the update to the FlipToast my personal favorite Facebook/Twitter integration App. Unfortunately I didn’t have the time to blog the update to FlipToast. But the flurry of activities does not limit to Store Apps, Microsoft also release what we could call SP1 to Windows 8 this week. BuildWindows8 Blog detailed these updates here. The updates brought needed performance tuning and Stability to the Windows 8 Core systems, including increased Graphic Acceleration performance. So here I was expecting a boring week in the store, but it turned out to be anything but boring. There are some noticeable apps released this week too. Early in the week debuted AppSwitch, an app to make life easier for Windows 8 users coming from other platforms like iOS and Android by recommending similar apps in the Win8 Store. I was contacted by the Vendors to request you lovers of Windows 8 to help make the app better by submitting your personal recommendations. 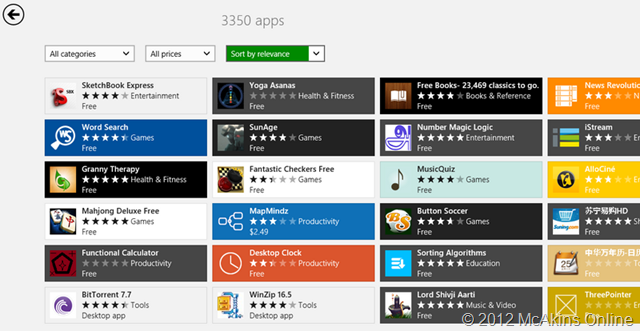 Do you know a similar or better app in Win8 Store compared to other platforms? Please submit so we can all make Win8 go bang! ArcSoft ShowBiz also debuted this week. This is another Video Editing app in the Store. Then you have what I called the most practical app in the Store: Windows 8 Cheat Keys. An app that help newbies and Pros alike to find and remember major keyboard combinations. If you love keyboarding on your PC, this is the app for you. Logitech also joined other Hardware OEMs in the Store by releasing their first Metro App in the Store: Logitech Camera Controller. On App Stats, as you can see we’ve crossed the 3K milestone in the Store! I was actually expecting the crossover last week, but then it’s still an incredible performance that Windows Store has more than 3K Apps before General Availability. And please don’t sneer and say that number includes Desktop Apps, yes specifically for this week I counted the total Desktop Apps in the Store, they are 86 in total, so deducting that from the total number, we still have more than 3000 Metro Apps in the Store. That is a huge Performance! How many Apps does Mac has in its App Store again? No wonder Apple didn’t release the Total number. Go Microsoft! 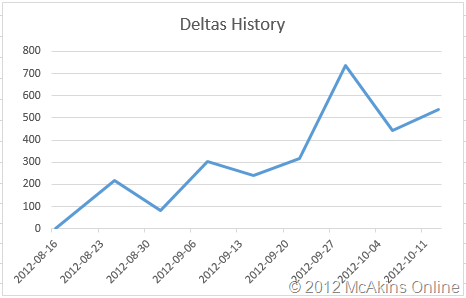 The Crown has returned to the Games Category and we see a sharp drop in the delta number for Sports category. 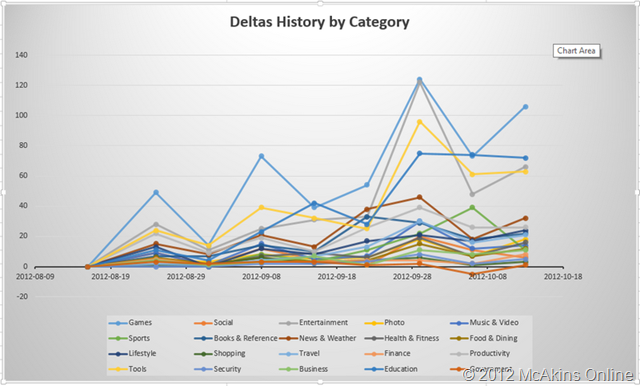 As you can see from the graphs, Games, Entertainment, Education and Tools are the most published Categories in the Store. They maintain a comfortable lead on the rest of App Categories. I will close this week by personal recommendation of two Apps, one in the Social Category and the other for the Toddlers. These are apps that are worthy of mention because of their quality and concept. First is MathBoad for Toddlers. The app supports Touch and Pen for scribbling, it brings the concept of Scribble Board back for toddlers. Second App is NowFloats, a Social App that brings new twitst to Sharing. I won’t give a spoiler here, but please see the app in the Store for yourselves. Note these apps are receiving average of 4.8 Stars in the Store. Click on the Pictures for the links. Well, that is the news from Store this week. The Roller Coaster is now gathering momentum, we are speedily approaching the Apogee of Windows 8 Events. Whatever happens you can expect yours truly to be all over it. Just another week and then the party will start. I will probably have missed something in the Store you might think is important. Let me know what you think. Please find the archive of last week’s post here below. Have a great week ahead.